Last night, we dined on lobster. By we, I mean everyone else but me because I’m not obsessed with lobster nor do I enjoy lobster goo all over my pajamas (I always wear pajamas to dinner). 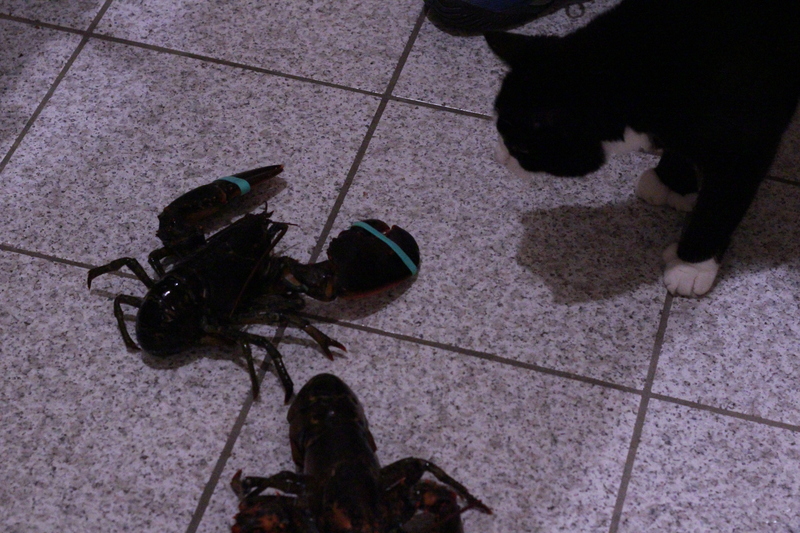 My cat, the lovely Jethro, got to meet his lobster friends before they were steamed in a wine broth (a nice way to go). This is the picture story of what happened. So I took the summer off. To work and relax and drink rosé with my cat. That does not mean I wasn’t baking! I was. Most definitely. I also got into arguments about the inherent misogynistic message in Grease but thats another story. What was I baking? Tarts and cakes and cookies and so much ice cream. I didn’t have a hungry audience of half-starved college kids to feed, but I did have a bunch of hungry chefs to feed. And they appreciated my attempts at interesting ice cream flavors far more than my collegiate cohorts. The favorite flavors so far? Honey-Thyme (which interestingly everything thought I had named Honey Time to be clever, but I’m not clever), Basil White Chocolate, Absinthe (which we ate early on a Saturday morning before a huge rush of taco lovers), and the pièce de resistance, Ginger White Chocolate.